For the 2018 model year, the successful story of the US best-selling vehicle is continuing with the facelift. The Ford F-150 has now been the top-selling truck for 40 years while has been the best-selling vehicle for 35 years. The number of sold F-Series trucks in 2016 exceeded 820, 000 units. Now, in order to keep its best-selling product fresh, Ford hurried with the facelift which comes only three years after its revolutionary redesign. Improvements are in all aspect but the star of this facelift is a new 3.0-liter Power Stroke diesel engine. Ford also upgraded gasoline powered units while F-150 also features a new face, tailgate and many additional features. 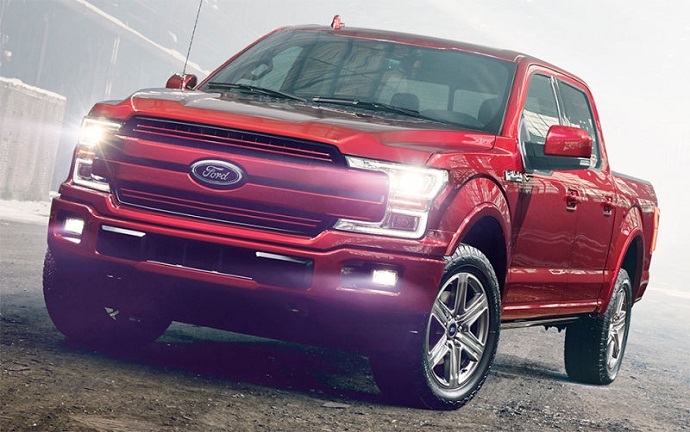 However, what Ford hasn’t said but some reports suggest is the new 2018 Ford F-150 Lighting version which should join the performance-oriented Raptor model. The Ford Lighting is a new performance-oriented version of the Ford -F150 which has been reported to return after its discontinuation in 2004. In opposite to the off-ready Raptor version, the Lighting model should have modified suspension and frame for the better handling and on-road ride. This version of the F-150 debuted as a 1993 model and was produced until 1995. The model returned with the new supercharged engine for the 1999 model but the production ended in 2004. Now, we have speculations floating about new version but Ford hasn’t said anything on this rumor and spy shots hasn’t also been available. As for the design of the 2018 Ford F-150 Lighting, we don’t have a clear picture of how this model will look as Ford hasn’t said anything about this truck. What we get from some sources suggest that this model should arrive in the regular cab formation and with the short bed like the previous versions of this model. The goal is to reduce the weight as much as possible in order to provide better performance and maneuverability. The model should also have lower ride height, unique suspension and some frame modifications which will be done in order to provide better handling and cornering. On the other hand, the model should also get sportier styling. A more muscular bumpers, sculpted hood, swollen fender flares and unique wheels should be there. We also expect unique grille design and specific trim accents. Inside, the F-150 Lighting should feature sportier and more modern design than conventional versions. Sports seats, unique trim accents, sports steering wheel, and high-end features should be seen inside the cabin of this performance version. This model should also get Ford’s latest infotainment system and premium sound system. A unique, stitched leather upholstery, heated and ventilated seats, and the latest safety additions should also be available. What would power the new 2018 Ford F-150 Lighting is also the matter of speculation as Ford hasn’t commented on this rumor. Ford will replace the 2.7-liter EcoBoost engine with the new generation version which features port- and direct-injection. More power should be available from this engine as well as from the revised 5.0-liter V-8 in the new 2018 F-150. The entry-level engine will also be the new, direct-injection 3.3-liter V-6. However, we don’t believe that any of these engines will sit under the hood of the Ford Lighting. A possible candidate is a 3.5-liter turbo V-6 engine. In its current form it produces 370 hp and torque of 470 lb-ft. The high-output version of this engine also powers the Raptor model where it delivers 450 hp and 510 lb-ft. The Lighting version should also get an on-road specific suspension system and specific brakes. The frame should also receive some adjustments. As per some reports, the 2018 Ford F-150 Lighting should arrive after the regular versions and new Raptor model. It should be sometime in the first half of 2018. The price should be slightly under the Raptor model.